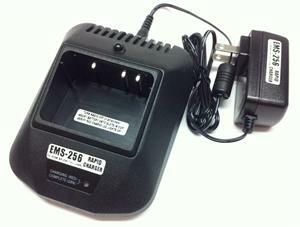 EMS-256 : Desktop Rapid Charger for ICOM-style BP-256 batteries. Charges battery alone, or you can insert the entire HT into the charger. Includes NEW upgraded worldwide AC-DC Power Supply. Charges the BP-256 Lithium ION battery safely in under 3 hrs, w/ automatic shut off. Charger is fully automatic; LED status indicators show Power, Charging, Finished, etc. This Charger can be operated from a 12-13.8VDC Cigarette Lighter socket as well.